Rahma Muhammad Mian is a media specialist, developing open data journalism partnerships and media and technology curricula for the ITU. She also curates the technology and society lecture series. Rahma also runs Mind Your Media, a media advocacy and public education project part of the Pakistan Coalition for Ethical Journalism at PeaceNiche. 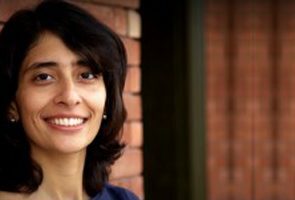 For over seven years, she worked in both print and broadcast journalism as an editor, reporter and producer with The Express Tribune, Express 24/7, Geo TV and The News. Rahma is a graduate of New York University’s Media, Culture and Communication department at the Steinhardt School where she was a Fulbright scholar. Her research interests are in media law, privacy, censorship and digital policy, governance and politics. Policy paper for the Jinnah Institute titled Pakistan’s Digital Future: The need for a multi-stakeholder approach to IT policy formation. Scheduled for publication in November 2013. Feature on the coverage of CIA drone strikes in Pakistan in the US media for the October 2011 issue of Extra! Magazine of Fairness and Accuracy in Reporting (FAIR), NYC titled Remote-Controlled Reporting on Remote-Controlled War. Master’s thesis on lateral surveillance; vigilante policing of Islamists online by US citizens titled Vigilante Counterterrorism on the Internet. 2013 Moderated panel discussion on Privacy Rights and Digital Surveillance at a conference on Freedom of Expression for Civil Liberties in Conflict Areas organized by Bytes For All in Islamabad in September 2013. 2012 MA Award for Academic Achievement in Media Culture & Communication - Persuasion & Politics. 2011 NYUFOCUS Mentorship Program for undergraduate students. Fall 2011-Spring 2012. 2011 Global Guide for Fulbright’s school program in NYC. Conducted sessions with NYC high school students on careers in media. Spring 2011. 2010 Fulbright Scholar 2010-2012 at NYU Steinhardt’s Media Culture and Communication Department. 2000 Awarded full scholarship to study the International Baccalaureate at the United World College of the Atlantic, South Wales, UK. 2000-2002. June-2013- Present: Project Director, Mind Your Media; A project of the Pakistan Coalition for Ethical Journalism and Peaceniche, Karachi Member, Pakistan Federal Union of Journalists. Member, United World College Alumni, Pakistan. Handle publications as well as a key role in the selection process.